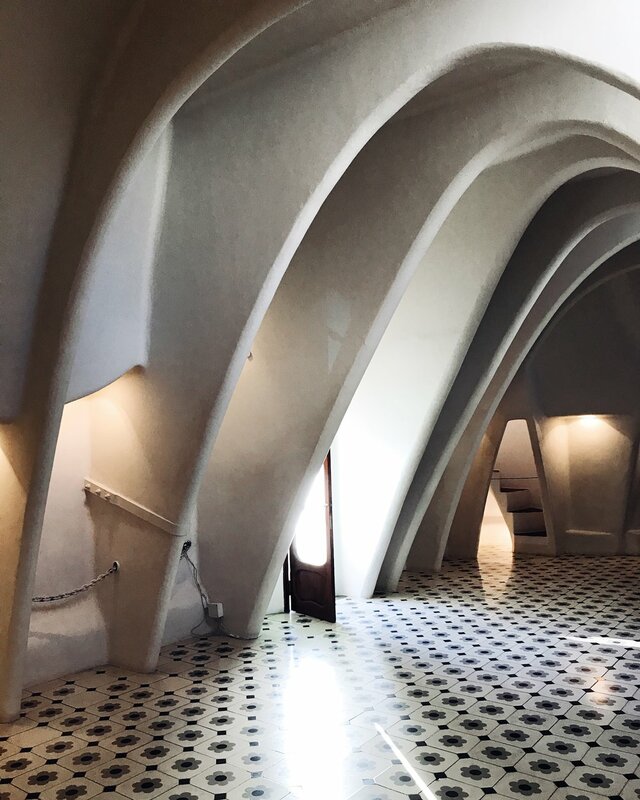 In late April I was lucky enough to travel to Barcelona as the guest of Casa Batlló, the iconic modernist house designed by architect Antonin Gaudí and now designated a UNESCO World Heritage site. Each year for the festival of Sant Jordi (St George), the patron saint of Catalonia, the house celebrates by decorating its façade with red roses in reference to the saint’s legend, and partners with a charity to promote a cause – this year it was Donor Sang, the Catalan blood bank. The tradition on Sant Jordi’s day is for people to exchange gifts of books and roses, and the streets of Barcelona were lined with booksellers and flower sellers while we were there — the perfect combination as far as I’m concerned! During the course of the weekend we visited two modernist houses — Casa Batlló and its next door neighbour Casa Amatller. Casa Batlló was designed in 1904 as the rebuild of an existing house, which had been built in 1877. It’s immediately recognisable by its irregular shaped windows and the flowing organic shapes of the stone work on its façade, which is decorated with a kind of mosaic of broken tiles. 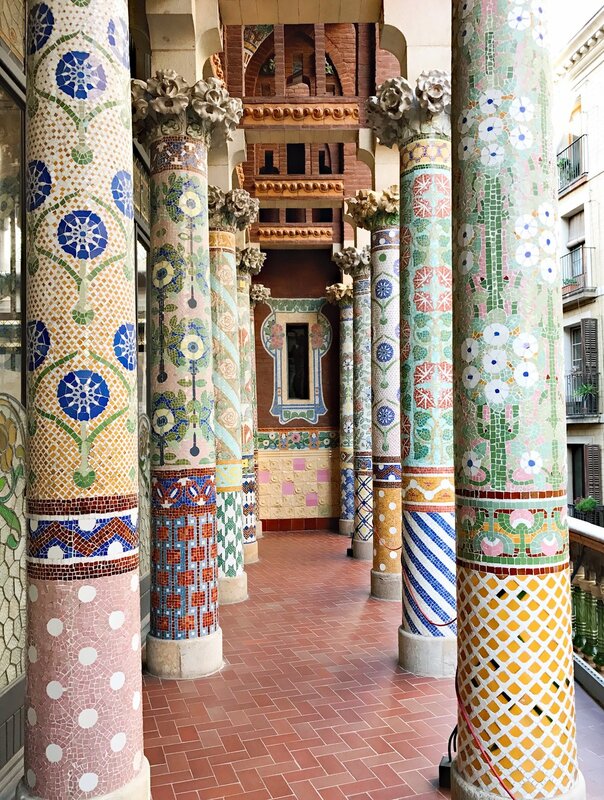 It was intended as a family home and was commissioned by Josep Batlló, a wealthy textile industrialist, and the family remained living there until the 1950s — part of it is still used as a private residence, which is amazing when you consider how many tourists visit the house every day! The line of the roof is very distinctive and looks like a dragon’s spine, in reference to the legend of Sant Jordi. 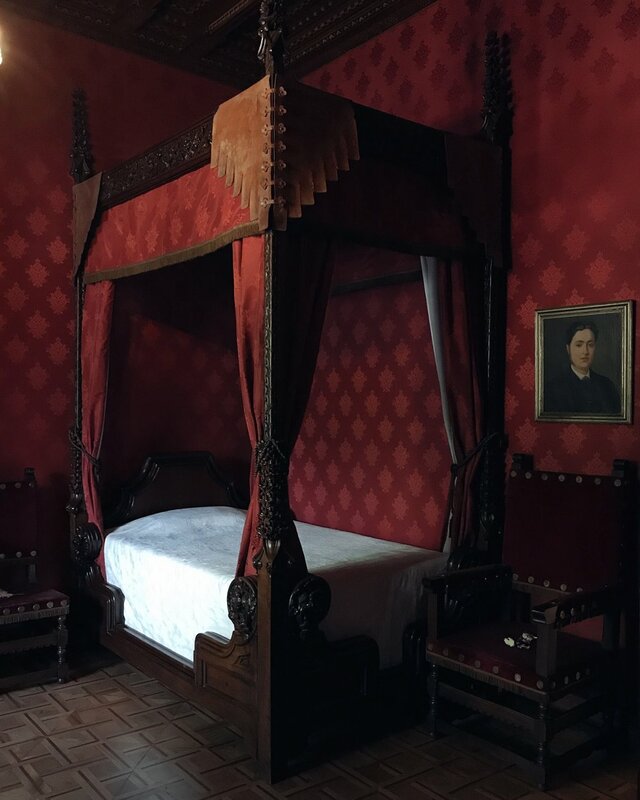 We also visited Casa Amatller next door, another modernist house originally designed by Josep Puig i Cadafalch in 1898–1900 as a family home for the Amatller family, who were well-known chocolatiers. I loved the interiors here — the way the house divides into more masculine and more feminine spaces, and the lovely light that pours in from huge stained glass windows. The other highlight of our trip was a visit to the Palau de la Música Catalana, the concert hall in Barcelona designed by another great modernist architect, Lluís Domènech i Montaner, in 1905. Like the other modernist houses we visited, the building uses curved flowing lines wherever possible, and is remarkable for how quickly it was built, using what were then very modern techniques. The basic steel structure was assembled very quickly, and stucco was used rather than stone for much of the interior decoration as it was quicker and easier to work with. The walls of the concert hall itself are made of stained glass panes set within arches on two sides, and above is an enormous skylight of stained glass designed by Antoni Rigalt — an inverted dome which immediately draws the eye upwards and means that the hall is filled with natural light during the day, unlike many other theatres I've visited. We were lucky enough to be allowed to watch part of a rehearsal of Beethoven’s Ninth Symphony by the Orquestra Simfònica del Vallès and to meet the orchestra director. Later that evening we got to attend the performance proper — to be able to experience such beautiful music in those wonderful surroundings was a real privilege. It was the first international “Instagram trip” I’d ever been on, and I was incredibly grateful for the opportunity to explore some of Barcelona’s best loved attractions and to get a glimpse of what goes on behind the scenes at some of these. I’m left with a desire to go back to Barcelona and spend more time there exploring the city — it had a real festival vibe when we were there and it's the sort of place you could easily spend a week exploring. * Disclosure: I travelled to Barcelona as a guest of Casa Batlló, who arranged accommodation at the Alexandra Barcelona and all meals, including lunch at El Nacional. This blog post is not sponsored, however, and the opinions in it are my own.